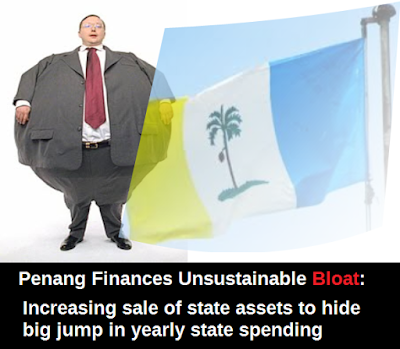 LSS: Penang financial management: An unsustainable bloat? Penang financial management: An unsustainable bloat? Expanding on the analysis of Mr Calvin Sankaran from his article here. Additional graphs. tables and commentary in blue italics are mine. When Pakatan Rakyat (PR) wrested control of five states in the 2008 General Election, it provided a perfect platform for the Opposition coalition to showcase its ability to govern. Many Malaysians were eager to see how PR would perform, especially in Penang and Selangor, two of the most economically advanced states in the country. Within a few years, reports of outstanding financial management in Penang by the DAP-led state government started to emerge. Media organisations, both local and foreign, reported that under new Chief Minister Lim Guan Eng, the PR government had cleaned up the books, eliminated debts and corruption, boosted revenues and increased state coffers by several folds. Speaking at the 7th Annual Corporate Governance Summit, Lim revealed the secret behind the success – the state government’s Competency, Accountability and Transparency (CAT) principles. He proudly pointed out that since PR took over the state, it had recorded budget surpluses every year. The PR state government, according to Lim, had transformed Penang into a shining model of good governance and one far superior to other Barisan Nasional-led state and Federal governments. 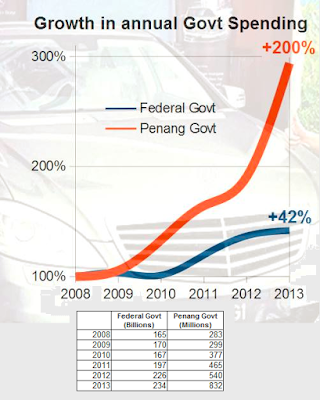 So how did Penang manage to achieve stellar results within such a short period of time? What are the important lessons that can be learnt from Penang in managing public finances? 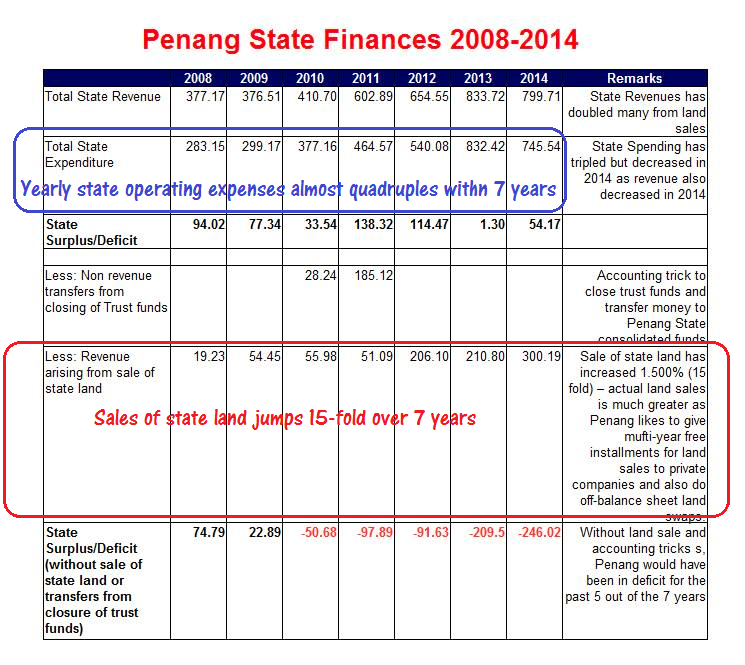 This analysis attempts to answer all these questions by studying Penang’s financial performance from the year 2007 to 2014 based on the state’s financial statements and the Auditor-General’s audit reports. In particular, we will examine three key elements of the state’s financial statement – Revenue, Expenditure and Consolidated Revenue Account. 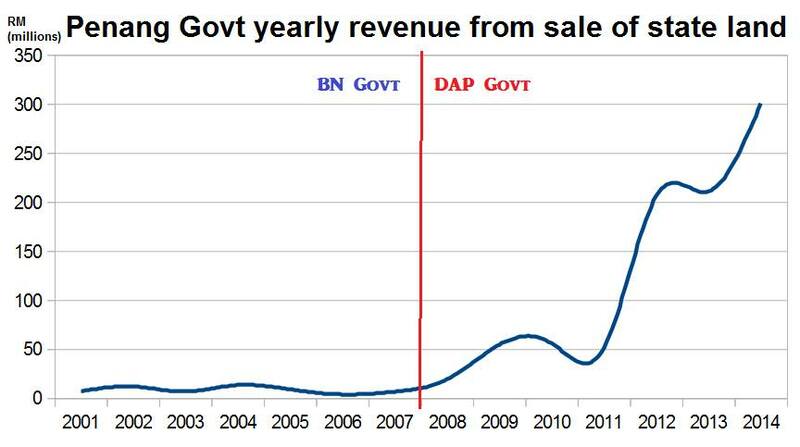 We will use the year 2007 as the baseline for comparison since it was the last full year of administration by the previous BN state government. For the current state government, 2014 data is used as the benchmark as it is the latest fully-audited financial statement available at this point of time. For the year 2007, the state’s revenue stood at RM 295.9 million and by 2014, it rocketed to an astounding RM 799.7 million. This translates to an increase of RM 503.8 million over seven years and a Compound Annual Growth Rate (CAGR) of 15.26%. This is indeed an impressive achievement by any standard. Let’s dive deeper into the state’s financial statements to understand how Lim was able to engineer such an outstanding feat of financial management. When we analyse the revenue, two particular items immediately stand out – land sales and quit rent. It quickly becomes apparent from these numbers that the state government has been selling public lands to private developers at unprecedented rates over the last several years. These massive land sales alone contributed hundreds of millions of ringgit to the state annually. For example, for the years 2012, 2013 and 2014, land sales brought in RM206.1 million, RM210.8 million and RM300.2 million respectively. In a complete contrast to this, there were no land sales in the year 2007. LELONG! LELONG! Land mostly sold or traded away. 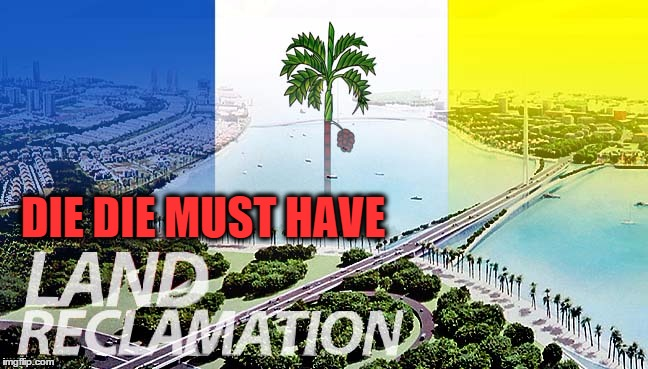 Unfortunately, the Penang State Govt has mostly run out of prime state land to sell and that is why they are pushing so hard for massive land reclamation deals at all cost. In their relentless effort to boost revenue, the state had also tripled infrastructure development charges, doubled the rezoning fees to 50%, hiked the land conversion premium and drastically increased the density for property development (plot-ratio). All these measures contributed significantly to the state’s revenue stream – in the last several years quit rent and land conversion premium charges added another RM150 million annually to the state’s coffers. Scrutinising the financial statements further, we discovered several highly irregular transactions and practices. For example, in the 2011 Financial Statement, there was a transaction which many might have interpreted as “creative accounting”. The state, for some unknown and unexplained reasons, had closed the Trust Account and transferred the monies (RM176.12 million) into its Revenue Account, thus artificially inflating the revenue numbers. Dodgy one-off accounting trick to transfer funds from a state trust fund to the state govt for a one-off gain in revenue. 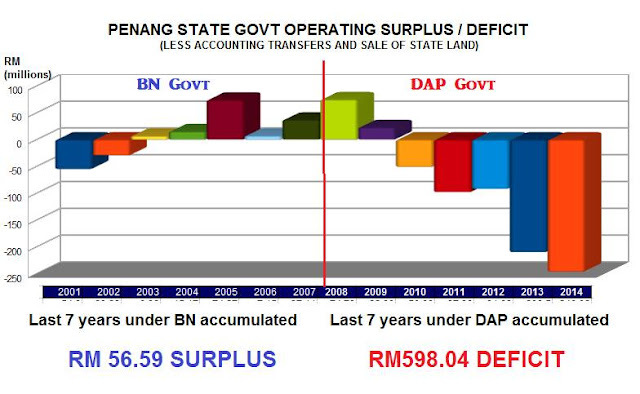 If not, the year 2011 would be in deficit for Penang. There is a reason why you keep money in trust fund - so the govt cannot simply use it - but it appears DAP state govt could not resist the temptation to take it. This is not an isolated case, for there were several other questionable transactions. Looking at the expenditure of the Penang state government, the numbers appear to be even more striking than the data for revenue. From RM252.3 million in 2007, it ballooned to RM745.54 million in 2014 – equivalent to a three-fold increase. If you compare the growth in spending by the Penang State Govt vs the Federal Govt spending, this abnormal trend is even more pronounced. Detractors will say that Penang is spending on growth but what if Federal Govt similarly hikes yearly spending by 300% and also claims it is for growth? When questioned about this, Lim responded that with the increase in revenue his government “was able to spend more on projects that benefitted the people”. However, financial statements do not support the chief minister’s claim. The data clearly shows that the state spends far more on administrative charges than on development projects. The total administrative cost has sky-rocketed from RM192.5 million (2007) to RM625.5 million (2014) – an increase of 3.25 times. The current government spends almost 75% of its revenue on administration while their predecessors only spent around 65% of the revenue on administration. Despite frequently repeated claims that Pakatan can eliminate corruption and wastages to reduce govt spending, not once have they ever managed to reduce spending. In fact, Spending has almost quadrupled in just 7 years. 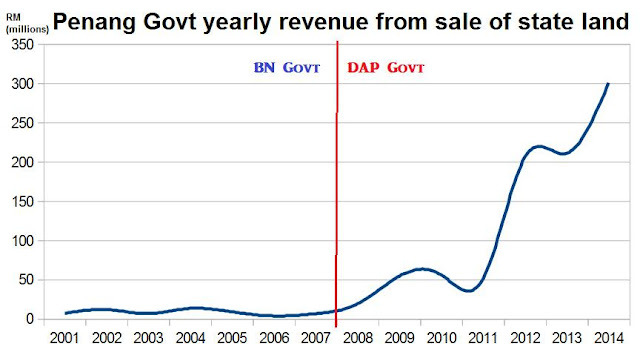 The frequently repeated lies of the previous Penang BN govt selling land for RM1 psf are also easily disproved here. - but it doesn't stop Penang DAP to continually repeat the same lies. It was NEVER RM1psf. Here is a recent news report for the so-called RM1psf reclamation deal where Lim Guan Eng has quietly extended this so-called RM1psf reclamation deal by 3 more years. You can clearly see that 191 acres will be handed back to the Penang State Govt as per the original agreement in 1990 - of which 110 acres of these super-prime land worth RM6.3 billion will be used for payment by the state government to the Penang Tunnel concession company. I wish DAP would stop with these RM1psf lies once and for all. At the same time, the expenditure for development projects increased by a mere 1.5 times (RM129.4 million to RM192.3 million) over the last seven years. 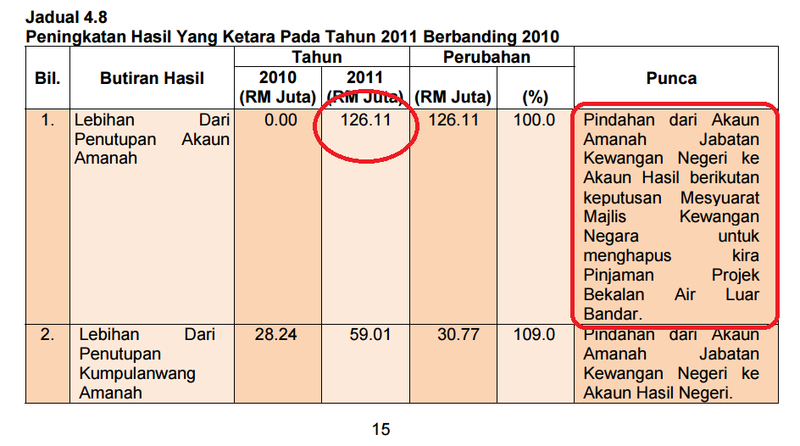 Taken as a percentage of revenue, the current state government spends far less on development than their predecessors (PR’s 24% vs BN’s 44%). In fact, instead of increasing, the state has actually reduced development spending in 2014. As such Lim’s claim that the state had increased spending on people-centric projects in tandem with the rise in revenue was clearly wrong and misleading. Further deep-diving into the bloated administrative spending throws out more surprises. Emolument, which includes the salaries, bonuses, allowances and other fees paid to state leaders and public servants, doubled to a massive RM142.3 million in 2014. Even more worrying was that fixed expenses had increased by a stunning 4.5 times to RM481.1 million. The financial statements do not provide details on this spending, though the A-G’s report indicated that some of the increase came from increases in salaries, allowances and additional new expenses. 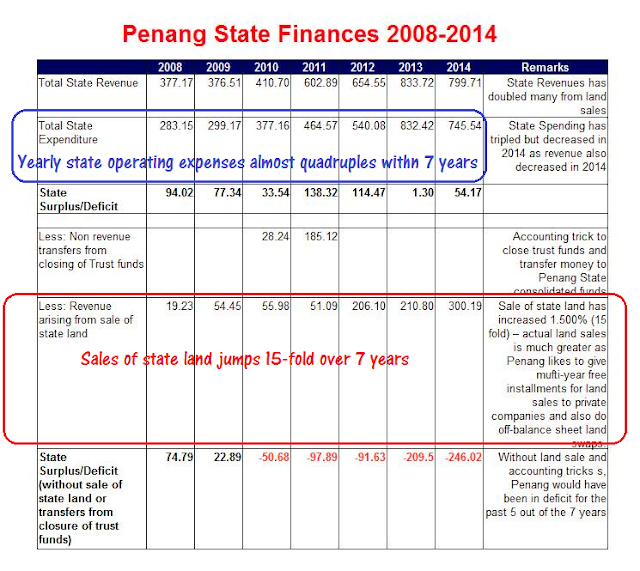 This big jump in fixed state expenses is particularly worrying as the normal operating revenue for Penang ie. Hasil Cukai and Terimaan bukan Cukai is only half of this at about RM200 million per year. 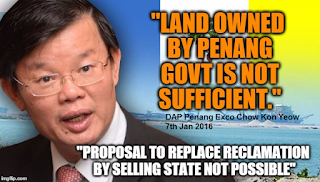 This means that from now on, Penang have no choice but to either sell more state land (if there are any left) or allow revenues from land reclamation. Consolidated Revenue Account is the term used for the public sector’s Profit and Loss Account and it shows the total revenue, total expenditure and the nett balance. 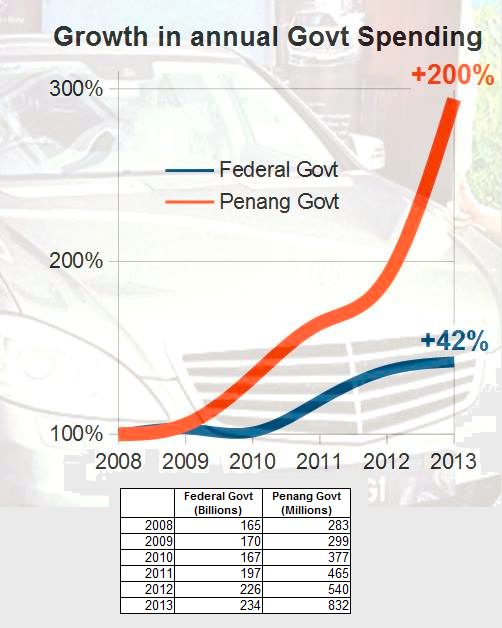 For Penang, the account shows a remarkable increase over the last seven years. From RM373.6 million in 2007, it has risen to RM880.6 million in 2014. While the CM is correct in saying that the state has been recording surpluses every year since 2007, this is also true for his predecessor as well. As such, the claim that Penang was almost bankrupt when Lim took over is too evidently inaccurate as the state had RM373.6 million at the end of 2007. Penang has seen a rapid increase in its revenue and significant expansion of its Consolidated Revenue account balance since Lim Guan Eng became Chief Minister. However, detailed analysis of the state’s financial statements reveal that these achievements were not due to excellent management skills, the much-touted CAT principles or policy-making but rather to some highly questionable financial practices. The revenue is being driven by the unsustainable and irresponsible action of selling public land to private companies. Most of these land sales were made to housing and commercial project developers and resulted in disastrous socio-economic consequences such as over-development, severe environmental degradation, sky-rocketing property prices, traffic congestion, destruction of heritage, decline in quality of life, etc. 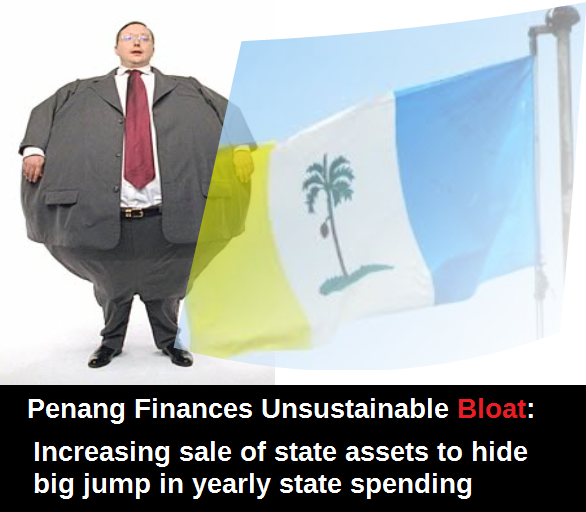 While Lim and his fellow Pakatan leaders have criticised the Federal government for its bloated public service and irresponsibility in spending public funds, Penang’s own financial statements show the state government to be even more bloated and wasteful. For example, it was reported that the CM himself has 20 Special Officers. The state also created numerous new agencies and institutes or expanded existing ones, filling them mainly with political members and supporters. The state had expanded the JKKK (Village Development and Security Committee) from 149 to 291 areas while at the same time significantly increasing their salaries and allowances. 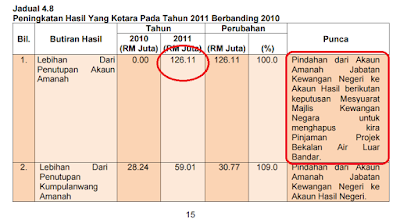 It was reported that the state allocated RM12.6 million for JKKK alone last year. This appears to be a politically motivated move as most, if not all, JKKK members are said to belong to political parties under Pakatan Harapan. The state government also upgraded the official cars for state leaders (including a luxurious S-Class Mercedes Benz for the CM) and more than doubled salaries and allowances for elected representatives and executive councillors. Mind-bogglingly, it also handed out welfare aid to the state’s notorious taxi and rickshaw drivers, an action that critics slammed as “vote buying”. Questions also were asked about the RM305 million the state spent merely to do a “feasibility study and detailed design” on the Penang Tunnel project. I believe these are merely the tip of the iceberg as a more detailed examination of the state’s books would reveal more such cases of mismanagement and wasteful spending. In conclusion, the claim of outstanding economic stewardship of Penang appears to be a mirage carefully engineered by the state government. Worse, the current financial practices and policies of the state government, if not reversed, can cause irreparable long-term damage to the state. 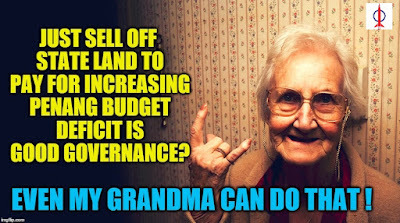 If selling state assets to fund an increasingly growing yearly state spending and operating budget deficit is your definition of good governance then almost everyone can be a good government. It doesn't take a genius to sell assets off. Unfortunately, there is a limit of how much more you have to sell and it seems that the Penang state govt had reached that limit - which is why the big push on land reclamation deals. 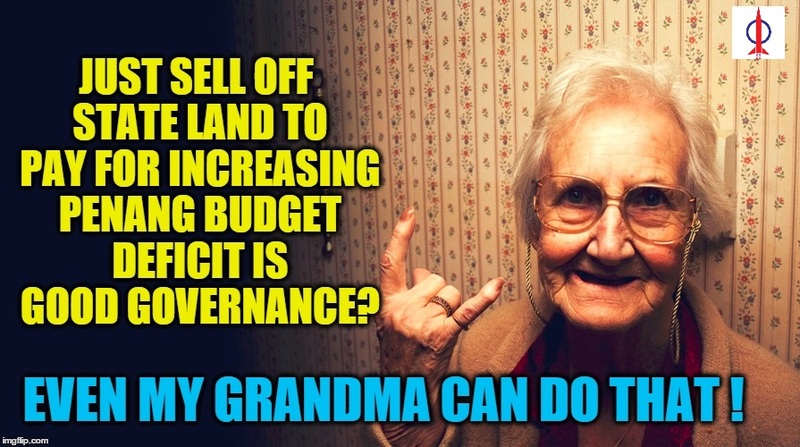 If the land reclamation deals are stopped or suspended, you will soon see a humongous state budget deficit soon. If you take out the revenues from land sales from the past few years accounts, this is what you will see. Feel free to come dispute my numbers. You won't find anything wrong with it though. Note: Don't be fooled by the often-repeated claim that the Auditor-General has said Penang govt finances is managed well. Auditors can only tell you if your accounts and finances are in order or in surplus or growing - they cannot comment on your business model - in this case, the selling of state assets. If you don't believe me, see how hard that Penang govt and DAP will fight for the land reclamation projects in the coming months. They will not yield to anyone (not even their fellow PKR ADUNS whom they will call traitors) - even if it means big environmental disaster for Penang. Not pushing ahead with the land reclamation projects would mean depleting revenues for Penang that will no longer cover their bloated yearly state expenses - meaning a big deficit that current reserves may not be large enough to cover. Don't believe me? See how hard and desperate Penang DAP will fight for this. They have no more choice. Anyway, I will win this bet as DAP Penang's State EXCO Chow Kon Yeow has already admitted on Jan 7th 2016 that the Penang state govt has run out of valuable land to sell.and have no choice but to do land reclamation. Nice analysis by Calvin. Unfortunately after reading the comments in FMT, the RBAs are still justify this as being lesser evil than BN devil, or questioning his qualifications, or even saying DAP is smarter for selling more land with more revenue in 7 years than BN did in the past 50. I salute u Lim, for doing what u r doing, but I fear the supposedly educated Malaysian people have been blinded so much that they would deny the sea exist even if its in front of them. They rather poke their eyes out & rip their ears off, in order to prevent the truth from reaching their brains. This goes for my family members as well, unfortunately. And this is different from the 1MDB model, how? Never mind that corporate & personal tax rates are fixed by the federal government. Quick questions for Sankaran - what are the current corporate & top personal tax rates in Singapore? How can Singapore maintain a healthy budget, finance increasing social & defence expenditures & still maintain a "triple-A" credit rating? Running a state govt is different from running 1MDB. 1MDB bought all those assets using debt and hence they are selling the assets to reduce those debt. 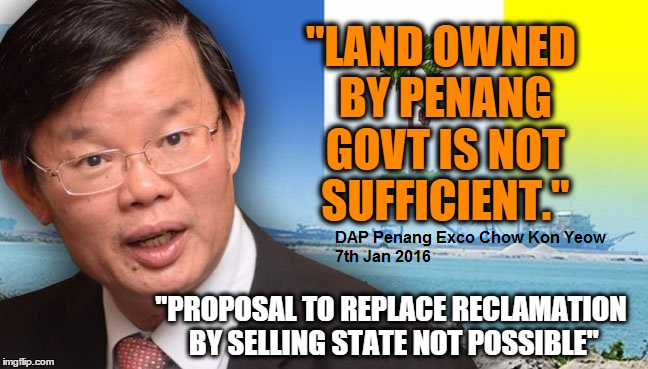 Penang govt did not have to buy those land, they just inherited them and now they are selling off their inheritance. As for Singapore, did you know that in 1993, the year before they implemented their GST, Singapore's corporate tax and income tax at 33% was higher than Malaysia's? As they progressively collected GST and continued to increase their GST, they have managed to reduce their corporate and income tax to17% vs 26% for Malaysia. One of the key aims of Malaysia's GST is to reduce corporate and Income tax - which Malaysia did by reducing it to 24% now with further reductions possible. BTW.. the majority of those RM100 billion per year illicit outflows from Malaysia is due to trade mispricing - where companies take advantage of the big tax difference to sell cheaply to Singapore to book lower profits in Malaysia while exporting at much higher price in Singapore to other countries to enjoy lower tax in Singapore. If Malaysia's corporate tax can be brought down to be near or the same as Singapore's then at least 80% of these illicit outflows every year would disappear. Even if its the same, other 'benefits' will still sway to them to SG, such as the opacity of money transactions. SG is becoming the Cayman of Asia. As long as the money cannot be taxed, SG Gov dont care how it comes in our goes out. thegreatteadrinkersouth....I don't think you question is quite relevant to the issue I have covered. I am merely analysing the financial performance of Penang and NOt defending 1MDB or the BN govt. Of course I can reply to your question as I am very familiar with Singapore however I'll be happy to reply your questions on my letter on this particular topic. True. Shameless Arul kanda copy penang style. Penang sold land first. 1mdb cannot copy lge style and sold land. Bn gomen only know how to copy copy. So penang gomen now a master devil la? All these dap stooges logical capacity so amuse me! Keep up the pressure, Calvin. Though I fear its too late now. Penangites have been enamoured with LGE & DAP that u may soon have to brace urself to be 2nd class citizen after Penang becomes a colony of SG. Thats the deal for SG to continue support PH to grab Putrajaya. "You Can Fool Some People Sometime; BUT You Cannot Fool All the People All The Time!". According to Pakatun policy, as long as you can fool most of the people most of the time, it is good enough to win Putrajaya. Where is Tony Pua? Why isn't he shouting, screaming or better still make a report to the police? I can't no longer take all these hubris from DAP. I will no longer vote for DAP. Horse & his 22 year legacy. Only then when this planetary alignment has happened shall the R.A.H.M.A.N prophecy comes true. jual apa pon tak apa, janji menang ok dah!